Bitti Bergamo was an Italian tennis player in the 1950s. Not much is known about his career except that he never get beyond the 2nd round of any major tournaments. Bergamo had a 6 planet stellium including the Sun and Moon in Capricorn, a sign noted for its determination and durability. The Sun is part of a conjunction with Mars and Saturn. Mars and Saturn are essentially opposites. Mars is active, assertive and dynamic wanting to get out there and compete, Saturn is restrictive, limiting and containing requiring hard work to overcome obstacles. Mars and Saturn in conjunction is like driving a car with one foot on the accelerator and another on the brake. Mars is strong in Capricorn but Saturn is stronger as the ruler of the sign. This suggests that Bergamo was strong on self discipline and worked extremely hard but perhaps did not get the career rewards that his endeavour deserved. The Sun / Mars / Saturn conjunction is also square to Uranus, indicating disruptive unexpected events in his life. Mars square Uranus is a classic accident prone aspect, perhaps even more so as Uranus is in Mars’ own sign Aries. The one major aspect from this Capricorn stellium is the opposition between the Moon / Mercury conjunction around the third house cusp and Pluto in the 8th house. Mercury rules movement, the third house journeys, Pluto as we know rules sudden unexpected explosive events and the 8th house traditionally rules death. 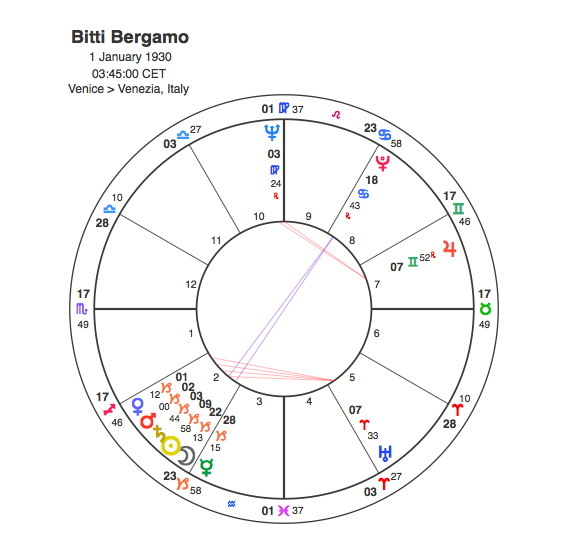 One fact that is known about Bitti Bergamo, he died in a car crash in 1979 at the age of 49 as Pluto was in square to his Moon unleashing the energy from the natal opposition. The Sun and Mars conjunct Saturn square Uranus pointed to a driving accident, Pluto did the rest.